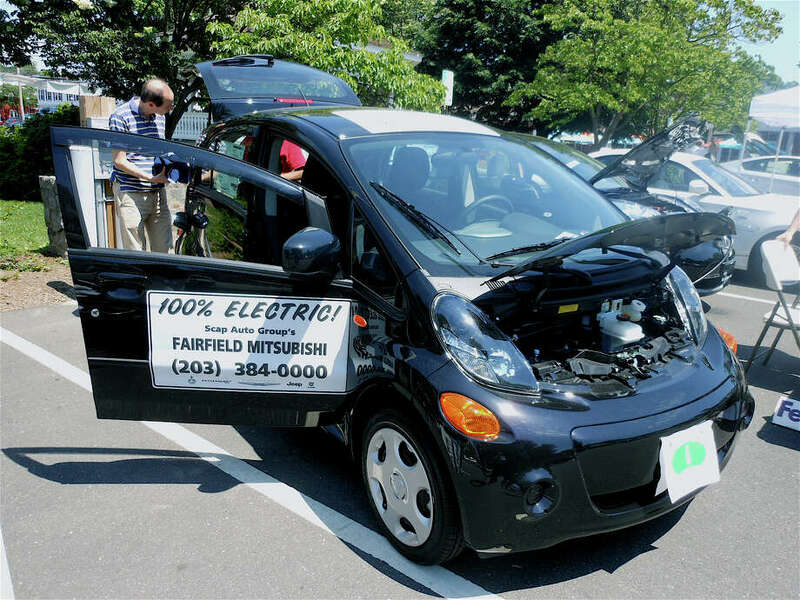 The Mitsubishi iMiEV, a 100 percent electric car, on display at the Electric Car Community Days event at Sherman Green on Friday. Charged up about electric cars and clean energy? Then the downtown parking lot adjacent to Sherman Green was the place to be Friday. The site was the setting for the first Electric Car Community Days program, offering visitors the opportunity to learn about five electric cars, electric car-charging units, gas-to-electric conversion systems and clean energy initiatives. It was a joint initiative of the town, state and the group, Connecticut's Clean Cities, a division of the federal Department of Energy. The program was scheduled to continue at the green Saturday. And to help whet people's appetite for electric vehicles, discounts were served up by nearby restaurants during the event. Similar programs were offered Friday and Saturday in New Haven, Stamford, Berlin and Norwich. The green, at Post and Reef roads, is also the site of an electric vehicle charging station, installed last year as a joint project by United Illuminating, the town and General Electric. "Clean Cities was founded in 1994 and the southwestern Connecticut chapter was the charter group," said Ed Boman, the assistant director of Fairfield's Department of Public Works and the Clean Cities coordinator for Fairfield County. "Between us and the local utilities, like United Illuminating, we promote clean energy, whether electricity or natural gas. We scheduled the event on both Friday and Saturday to give businesspeople and families an opportunity to see the exhibit." One of the electric vehicles on display was the Chevy Volt. Warren Greatsinger, a sales consultant at Maritime Motors of Fairfield, said the Volt is one of the most popular American electric vehicles, or EV. "The key to the appeal is 35 miles on the initial charge, with a gas back-up generator that gives an additional 315 miles on a 9.3-gallon tank," he said. "The car seats four, too, with a solid amount of trunk space. The speakers also use 50 percent less power than conventional speakers and the A/C system provides ecological controls for energy savings." Cole Porter, a manager at Crabtree Colonial Toyota of Milford, was on hand to detail features of the 2012 Prius Plug-in. "It runs pure electric up to three miles then switches to hybrid mode that allows an average of 77 miles per gallon, with a 10-gallon tank," he said. Porter mentioned that the Prius is the third best-selling model line in the U.S. while the Prius C, which gets 50 miles to the gallon and costs under $20,000, is the fastest-selling. Representatives from BMW, Nissan and Mitsubishi rounded out the group on hand for the program. Electric-powered vehicles on display included BMW's 100 percent electric Active E, of which only 700 have been produced in the U.S.; Nissan's LEAF, the best-selling electric vehicle in the world, and Mitsubishi's iMiEV, also known as the "iCar." Larry Kaley, a representative of the Fairfield Clean Energy Task Force, was on hand to provide information and registration material for Connecticut Clean Energy Options. "This is a way for people in different communities to support clean renewable energy," he said. "For every 100 people that sign up, the town gets a solar array, which is a solar energy system with a $20,000 value, for a school or public building. The systems reduce the bill the town pays for electricity usage." Encouraging commuters to consider alternate-transportation to private cars, Ed Perzanowski, the outreach coordinator for CT Rides, talked about his ride-sharing group. "We help people find carpools to join, provide rewards and generally seek to cut carbon emissions."